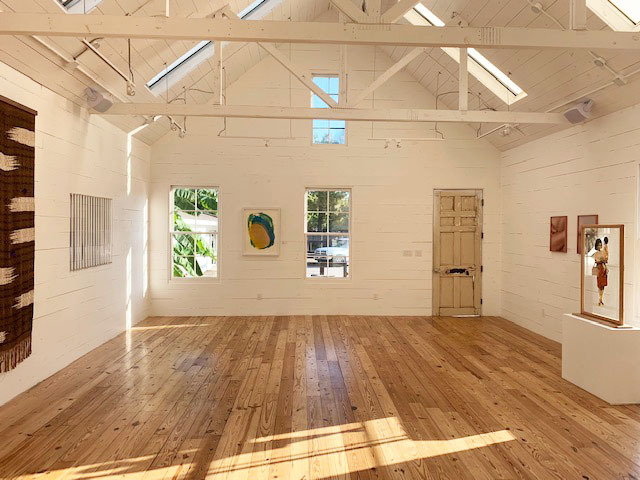 Movement through five major mediums in a sunshined filled shiplap gallery space, Mujeres del Sur / Women of The South, is a group exhibition that encompasses fifteen contemporary Latina artists living and working in Southern Texas, well curated by Theresa Escobedo. Before one even delves into the various works within the space, one can already sense the balance between their honored heritage and their current home just by the title. This exhibition isn’t simply a collection of women artists. It isn’t just a visual interlude of Latin culture either. Mujeres del Sur is a vibration of validity for each artist’s medium and each piece’s mark within the space. While some work could be defined by a satirical sense, leaning towards the obvious feminine subject matter and cultural nods, other work stands as a broader statement of conceptual practice that would require an artist’s aural interpretation to fully take the piece in. This show, in regards to particular themes, could be categorized into three main connects: color, concept, and connection. These threads help craft a narrative that elevates the work of these insightful and talented women who are not just noted as Latina artists but taken seriously as visual artists in the art world. These elements also help carry the weight of the show, pulling together the pieces that would be more obvious in concept vs those that dig deeper into the artist’s intentions beyond the material. Laid against the stark white background flooded by natural light from the windows hang a multitude of pieces that cradle color through the hands of the artists. The smallest work in the show that might be overlooked until you exit, featured as soon as you walk into the gallery, is a balance of color within the face of a young woman. Jasmine Zelaya’s PYT is a small portrait that includes light blue flowers adorned in her hair while the same flowers but in black trail down her face. Those particular flowers are overlapped with tears from bloodshot eyes of the face as a juxtaposition to not only the title of the piece but the strong pop use of floral pattern within the piece. An additional work steeped in color includes Tere Garcia’s Lumen I, a digital chromogenic print. The artist’s work uses conceptual techniques to intervene between the photographic process, assisting within the image making process in order to offer a less stable foundation, allowing for the hues of color to rest uneasy upon each other. A skilled use of texture and color on the largest scale within the show is presented in Jenelle Esparza’s Dancer in an unconscious rhythm. A tryptic of panels featuring a beige piece with a delicate cascade of maroon necklace like draped knit down the middle is matched with two black and beige horizontal patterned pieces on the left hand wall of the gallery. The title suggests the musicality within the use of cotton warp, weft, and silk tied to a broader cultural nod within her recent project, El Color de la Obra, influenced by interconnected histories of South Texas cotton fields. A direct connection to the natural world is made through three pieces within the exhibition, also strongly showing the artist’s transformation of color within their practice. Some of the standouts of the curatorial effort stand out within Xochi Solis’ Under the traveling cordless moon, a triad of methods including collagraphy, photo lithography, and serigraphy on paper. This work layers different saturations of yellows, blues, and greens within a meditative moon phase like pattern ending with the most abstract strokes of color at the end. Lorena Morales’ Chromolight 17BS37 (Bajo el mismo cielo/Under the Same Sky) features her signature acrylic rods with rich concentrated color. Her pillars of nostalgia and joy within lines and shapes are present within these work, dialoguing well with the natural light along with the shadows that alters the piece along with a viewer’s movement around the work. Another large piece dialogues with the natural textures in Ezpara’s work on the opposite wall, featuring a flood of orange and red flowers cradled beside a honeycomb in the hands of a woman. Paloma Mayorga’s Poderosa (Powerful), a digital c-type print, is an anchor between the tie of color and concept within the show, nodding to her process of a visual and literal narrative that circles back to women’s bodies and the earth. The piece speaks to the direct subject vs. concept relationship, something that is common within the next thread within the exhibition: concept. Three of the artists within this show are noted photographers who use their concepts either directly or indirectly in their visuals. Karen Navarro featured two pieces from her Soft Objects series including Untitled (Fishnet tights) and Untitled which reveal the feminine form that lies within the angels of particular body parts partially covered with fishnet fabric mildly disguising the bare skin. Her photo process blurs those lines of identity and social concepts of women. Stephanie Concepcion Ramirez’s photo Untitled (Excuse me, sir) and Delilah Montoya Elisabeth “Pink Panther” Monge offer the opposites of presentation. The first being a capture of a unbusy washateria, focusing on the lighting and angle of the building. The second is a large portrait of the feminine strength within the “Pink Panther’s” boxing stance, classically depicted in black and white. In three of the works within the show, the use of symbolism stands as a story. In Lisette Chavez’s Deliver Us from Evil (a sculptural piece featuring graphite drawings of a baby with devil horns sleeping below a mobile with cut outs of weaponry and the devil), and Julia Barbosa Landois’ Colonial Bread Meets Natives (a ink on paper and acetate on a Colonial Bread Company lunchbox), the direct pictorial elements inform the viewer allowing for the importance of cultural references while looking for the artist’s concept to fill out the narrative they wished to create. The same goes for Allison Valdivia’s Doña Raquel y ‘Vira, an oil on glass piece within a frame, placed on a pedestal allowing for the travel of sunlight through the work. The absence of the backgrounds helps echo the forgotten or withheld stories perhaps cradled within the memory of mother and child, held tight within just as the mother clutches her little one. The theme of connection is carried to another work evoking the mother child bond within Thoughts of Motherhood. A mixed media on arches paper by Jasmine Zelaya (who also was the artist for the exhibition’s entrance piece) is a colorful depiction of a mother with child within her womb, surrounded by the foliage of nature including her thematic pink and purple flowers. Luisa Duarte’s two monotypes on paper entitled Excavation site and Stone Site, and a cast plaster sculpture entitled Prototype I are some of the stronger works in the show. For Duarte, a large portion of her work has been about constructing her world as she settles in America. Shortly after moving here, the major crisis Venezuela happened. Feelings of unease, anguish, and an inability to be connected to family and friends going through the turmoil, Duarte turned to art that allowed her to process these pieces. These particular monotypes in the show embody the concept of the artist constructing her world in America after her move. Also these particular monotypes, layered with colors of gray, purple, and other ominous tones, fade together to create a personal space of reflection within the sharp architectural angles. One of the major stand outs for the exhibition is the site specific installation by Daniela Cavazos Madrigal entitled Sopita De Letras. This piece covers the basis of concept, material, culture, and presentation with the use of embroidered belongings of the artist’s grandmother, adorned on clotheslines in a corner of the gallery. The sentimental subjects cascade down in forms of socks, undergarments, and dish towels with phrases in cursive. This piece balances between references and revelations, a piece where the artist’s hand and heart is apparent in every stitch. After walking through the space, listening to the synopsis from a handful of the artists, along with knowing the background of the show, the general feeling of this exhibition and the work is a combination of understood observation and longing for more than the concept presented. We see articles, comments, and posts all circulating about the shift in the image of women and race on a daily basis. The common thread we see runs through but rarely stitched together to make a larger tapestry of concept and progress. Perhaps it is truly a calling for the arts, especially the visual, to help facilitate a deeper dialogue away from the stream of media. Perhaps the artists can take the visual aspects of their work and translate more into the conceptual power of their written statements, allowing for a viewer or curator to truly strengthen the dialogue of their efforts. Perhaps Escobedo as a curator and The Union will be able to assist with this cultivation of cultural discussion. Many good works of art, including those noted within historical contexts, is a balance of 50% of the artwork’s communication to the viewer and 50% of the viewer’s interpretation. Many of these works are good works of art and as a writer and viewer want to know more of what pieces of the artist’s cultural, personal, and conceptual life propels them to make the work they make. Overall, this show is most certainly a visual poem to the strength, creativity, and well presented work of these women artists and from this has led to a positive connection between the community. Also as seen with this show, the foundation of an incredibly important movement of artists and work is there fittingly placed within a historic home-like structure. We are looking forward to the architectural build out of artistic ideas and the intersections it will connect in the future. We are also looking forward to supporting the artistic efforts of these talented women both in making and curating new work here in Houston and beyond.